On December 26 from 5:00 am – 9:00 am the fire sprinkler system will be shut down to modify/add new sprinkler units in Peace Health North. This is part of the renovation in rooms 518 – 519. Building users should not be affected any more than the standard construction being conducted now by the project. Horns, Strobes, and Speakers on the fire alarm system will not sound after the scheduled time. Provisions have been taken to monitor the building fire systems during this time and alarms that occur after the scheduled time should be considered real events and occupants should evacuate as usual per the U of O Emergency Procedures. For questions or concerns please contact CPFM Design adn Construction Project Manager Tim Allenbaugh at 541-346-8214. Starting December 10 through December 21 Fire and Life Safety has scheduled Fire Alarm Testing in various buildings campus wide. Tomorrow (Tuesday 10/30) sometime between 12:00 pm and 5:00 pm the UO Fire Marshal’s Office needs to conduct a test of the fire alarm system in the Data Center at Oregon Hall. The alarm will only go off inside the Data Center, but there is a chance that building occupants could hear it on floors above. This is an emergency repair to the system, and Data Center staff is aware of the situation. 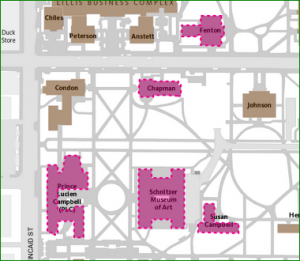 A follow-up fire alarm test throughout Oregon Hall will need to happen at 6:00 am on Wednesday 10/31. All alarms will be silenced by 7:00 am. On Wednesday 9/19 from 6:00 AM- 7:00 AM, The City of Eugene has scheduled fire alarm and flow alarm testing at Oregon Hall. For questions or concerns please contact CPFM Design and Construction Project Manager Patrick Mucker at 541-346-8216. 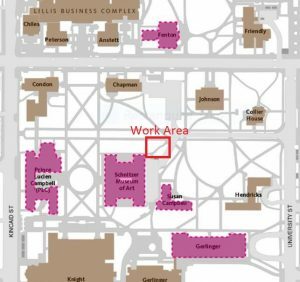 As part of the Oregon Hall Renovations Fortis, Construction will be testing the fire alarm system on 9/13, and 9/14 from 6 am – 7 am each morning. As part of renovations, contractors are installing a new sprinkler head located in the basement of room 7D. July 12, 2018, from 6:00 am – 4:00 pm. This will require the building sprinkler system to be temporarily drained. 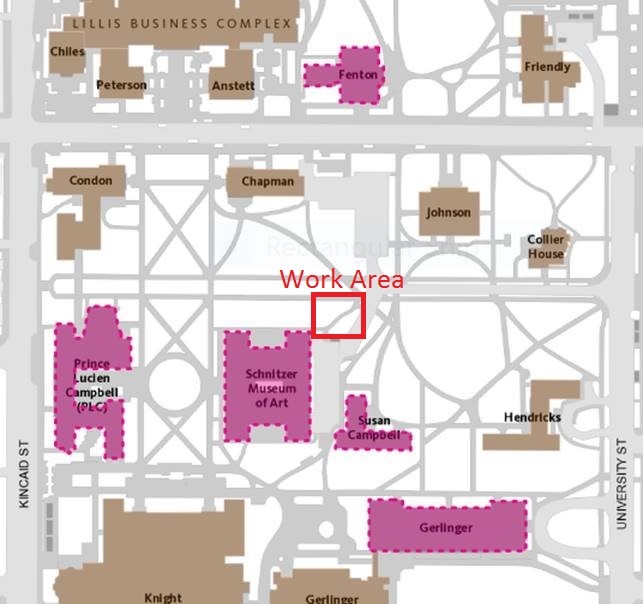 There will also be construction activities in the area of the replacement. This will require the fire sprinkler system to be offline during this time. Provisions have been taken to monitor the building fire systems during this time and alarms that occur after the scheduled time should be considered real events and occupants should evacuate as usual per the U of O Emergency Procedures. Starting June 26, 2018 through August 16, 2018 Fire and Life Safety has scheduled Fire Alarm Testing in various buildings campus wide. On Monday June 18, 2019 from 6:00 am – 7:00 am there will be a building wide fire alarm test. This will result in a loud alarm noise, but there will be no other impacts to the building. PeaceHealth Property Managers, along with its contractors, will begin testing the fire alarm systems, lights and sprinklers at 11:00 am on Thursday, May 10th. They will also be conducting a walk-through of the entire building and going room to room to test smoke detectors. Annual fire alarm and sprinkler testing is scheduled for Tuesday 3/27 and Thursday 3/29 in the below listed buildings. On March 1, 2018 from 6:00 am – 7:00 am the Fire Marshall will perform a test of the new fire panel at LILLIS Business Complex. As part of the Tykeson Hall project JSMA, Chapman Hall, Fenton Hall, PLC and Susan Campbell will be on active fire watch on January 17, 2018, from 7:30 am – 5:00 pm while contractors have the water distribution temporarily shut down that services the fire sprinkler systems. The fire alarms are still active, but the automatic sprinkler will be temporarily shut down. Fortis Construction is providing fire watch to all building except JSMA. Museum staff will be providing fire watch for JSMA due to security reasons. The UO Fire Marshall Office will be communicating with the Eugene/Springfield Fire Department. You may also contact Fire Protection Manager Simon Ditton with Safety and Risk Services at 541-346-2958 if you have any questions or concerns. For questions or concerns please related to the project contact CPFM Design and Constructions Owners Representative Martina Oxoby at 541-346-5880. 1600 Millrace fire alarm and sprinkler testing is scheduled for December 20, 2017, from 5:30 am until 8:00 am. 1715 Franklin fire alarm and sprinkler testing is scheduled for December 20, 2017, from 5:30 am until 8:00 am. Computing Center fire alarm and sprinkler testing is scheduled for December 19, 2017, from 5:30 am until 8:00 am. Onyx Bridge fire alarm and sprinkler testing is scheduled for December 14, 2017, from 5:30 am until 8:00 am. Klamath Hall fire alarm and sprinkler testing is scheduled for December 14, 2017, from 5:30 am until 8:00 am. Lewis Integrative Science Complex fire alarm and sprinkler testing is scheduled for December 13, 2017, from 5:30 am until 8:00 am. Lokey Laboratories fire alarm and sprinkler testing is scheduled for December 13, 2017, from 5:30 am until 8:00 am. Due to the possible impact to research data collection, the fire alarm testing will take place on a future date, yet to be determined. A new notice will be sent when coordinated at a later date. Streisnger fire alarm and sprinkler testing is scheduled for December 13, 2017, from 5:30 am until 8:00 am. Huestis Hall fire alarm and sprinkler testing is scheduled for December 12, 2017, from 5:30 am until 8:00 am. Willamette Hall fire alarm and sprinkler testing is scheduled for December 12, 2017, from 5:30 am until 8:00 am. The fire system water line will be shut down between the hours of 7:00 AM to 5:00 PM on Saturday, September 16. During this time the fire sprinkler systems will not be active. Fortis Construction will be conducting an active fire watch. The main domestic water is not affected. We anticipate vehicle access to lot 25 will not be impacted. For questions or concerns, please contact CPFM Design and Construction Owners Representative Martina Oxoby at 541-346-5880 or 541-556-8477.